Hurricanes and Nor'Easters along with traveling to Virginia for Thanksgiving seem to be all behind me now... I'm back and hope to regain a regular weekly Dorie recipe schedule. As a child I was subjected to "food torture" tricked into eating tripe, sweet breads, and calf's brain... to name a few of the delicacies my grandparents forced upon me in the name of food heritage. So the thought of making beef cheeks for my family was wholly unappealing... I bought beef chuck. When I told my kids what was supposed to be in the stew their reaction surprised me. My 11 year old daughter said, "Well, they might be delicious, especially after they have cooked for a long time in wine." She is probably right, as it dawned on me that I wasn't protecting them from anything, I was avoiding dealing with my own food phobias. When I first tasted the stew I did think it needed a top note, so I grated a little orange zest into it. This really brightened the dish without being over powering. The other things I did a little differently than Dorie instructed was I deglazed the pan with 1/4 cup of the wine after I braised the beef. Then I poured the reduction over the beef. I also used a plastic spatula, not a wooden spoon, to scrap the pan. I think it removes more fond easier and prevents burning. As for the end result... superb. My husband commented on how rich and earthy the sauce was, and my kids both loved eating it over pasta instead of with bread the way we typically eat stew. I loved the velvet sauce and the subtlety of the flavor. Dorie was right, the chocolate wasn't over pronounced. Truly a classic stick to your bones comfort stew. 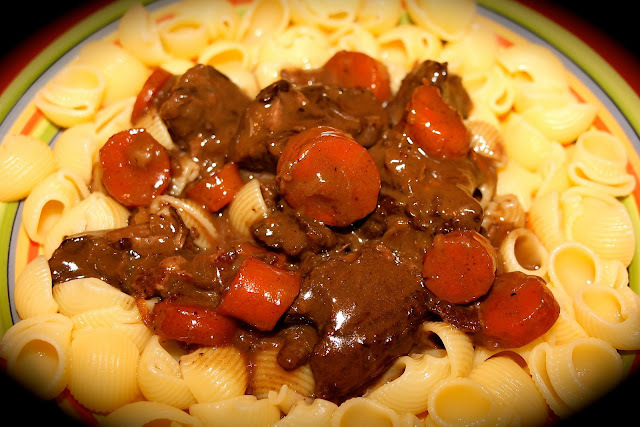 Here is a similar Beef Daube recipe from Dorie. This looks delicious, Diane! I don't know how I would feel about tripe, sweet breads and brains - knowingly eating them. I'm pretty sure it would be a phobia for me! Ah, so you saw this post and know the strange things I had to eat. Tongue was another one. The texture is what I remember the most about these organ foods... it just was not appealing. I guess you can get used to it. This was pretty darned tasty - and I love the idea of a little orange zest! It really was... I'm thinking about making this a head of time and serving it on Christmas Day when guest stop by I think it has such mass appeal. The orange zest was a nice touch. One of my grandmother's was a pig farmer in Italy. You do grow up not being wasteful. The French definitely get this... isn't there a saying, "What an English family throws away a French family can make dinner." Definitely what an American family throws away. I like the addition of the orange zest. My husband loved the dish, but he kept saying it needed "something." I'll have to try that next time! Lovely job on this dish! Exactly how I felt.. yeah try the orange it may be the thing for you too. It really was good, wasn't it? I like the idea of a little orange zest. I've never been a braised beef fan, but this recipe won me over. I never liked beef before I started cooking these French recipes. They really get how to improve the texture of beef. This just looks and sounds like heavenly comfort food to me! I just love it! Sounds like you have a pretty sophisticated 11 year old! A Dorista in the making maybe? We loved this. I thought about making a gremolata but got lazy. Good idea to grate orange! She is going to be more Dorista than any of us. She is already a seasoned pastry chef. I agree with Guyla…very sophisticated for an 11 year old!! I like your touch of the orange zest…this was a keeper in our house…very delicious!! Lovely photo!! I like to take some credit for exposing my kids to different foods but as most kids do she has out foodie me. I liked the change of putting it over pasta instead of bread too! :) A pleasant change for an interesting stew! I think I've gotten too stuck in my thinking that you only put butter or tomato sauce on pasta. It is much more versatile than I realized. Yum, orange zest! It looks great. I think most of us used chuck and it was really good. I haven't found any one yet who was able to get the cheeks. Let me know if you find someone. I'm glad to hear that life is getting back to normal for you, Diane. I can just imagine the orange zest and how well it must have gone with the chocolate undertones of this dish. It was true inspiration... or I'm really starting to know how to cook? I think there was another beef dish we made that had orange zest? Or am I imagining this? lol. I had a tripe obsessed grandfather. Was scary back then but not so much anymore. I'd a done the cheeks if I could have found them. Diane, you are thinking of the short ribs that had the orange zest 'gemolata' on the top. Thank you Trevor for refreshing my memory. I think it is interesting, Diane, that your kids (and other food bloggers' children) are so adventuresome, maybe, more so than you and me). I grew up in an Iowa household and we were pretty meat-and-potatoes, rather simple fare. I cannot compete with the tripe, sweet breads and brains that your grandparents served, my grandmother did serve tongue every so often. (I actually liked it.) I loved your expression, "When I first tasted the stew I did think it needed a top note, so I grated a little orange zest into it." Your daube looked delicious and I think it's getting good reviews with all of us this week. You have had quite the Fall, and you didn't even mention your doggie issues. Hopefully the holidays will be smooth sailing for you and your family. You aren't kidding what a Fall... I need to nest and relax this winter. I think the note express probably comes from my time with the opera singers...if you recall my post about the peach melba. Great to hear from you... sounds like you have been having a nice time with friends and family. Hi Daine! Orange zest sounds like a great addition to this dish! I will try it next time I make it, veery soon!! Ugh tripe! I have a co-worker who brings in canned tripe soup regularly for lunch and it makes my stomach turn! So far I haven't read anyone who actually did the beef cheeks yet but if I could find them I would be willing to try it I guess. Your daube looks delicious! CAN TRIPE SOUP... it should be illegal. Thanks for stopping by. Diane, it is nice to read that things are generally on the mend and I hope that you will have relaxing and/or quiet holidays! Your Beef Daube looks like the perfect comfort food and it is wonderful that you are raising your children to be such" adventurous and curious eaters" - my children devoured the Beef Cheek Daube and literally fought over the left-overs (they did know about the cheeks), I guess we are doing s.th. right?! Isn't wonderful when you cook good food kids eat it.